Back when I was young(er), my weekend means going to gigs and local events, watching local bands performance. As you might probably know, I am a music aficionado. I love almost any kind of music and I got a kick out of watching live music. It all started when I was in high school – with the permission of my parents, I frequently attended other school’s Pentas Seni (school festival), in which there were bazaar, dance shows, and of course, music performance from local and indie artists! Some of the famous ones (and the ones I can remember) were PL Fair, Tarakanita’s, and Kresikars of SMU 82. When I went to college and had less supervision from my parents, there’s a very little chance that I missed out on going to local music events, especially the ones held by students in my university! And trust me, there were a lot of them.. hahaha. I was also a member of the university’s student radio as a music director, which means I had to come to those kind of events to scout new music (I took my job seriously hehehe). Some of the bands that I liked to see are Pure Saturday, White Shoes and The Couples Company, The Milo, The Adams, Mocca, Sore and the likes. I can say that I had a pretty fun college life. Nowadays, I don’t go out as much. I hate to say it but I feel like my life has became.. dull? (I hate to say the word but I can’t find out better words to describe this!). My “partner in crime” has gotten married, living hundreds miles away in England and is expecting her first born. Most of my friends are married and some with kids too. I do have younger friends but they are not into music as much as I am, with them I love to travel and try out different kinds of food. When I go out, me and my friends would prefer acoustic sessions in cafes rather than full band performance in music festivals.. simply because we would rather opt for something more comfortable! Hahaha. As much as I enjoy my weekends nowadays, I sometimes miss going out to gigs all night long! 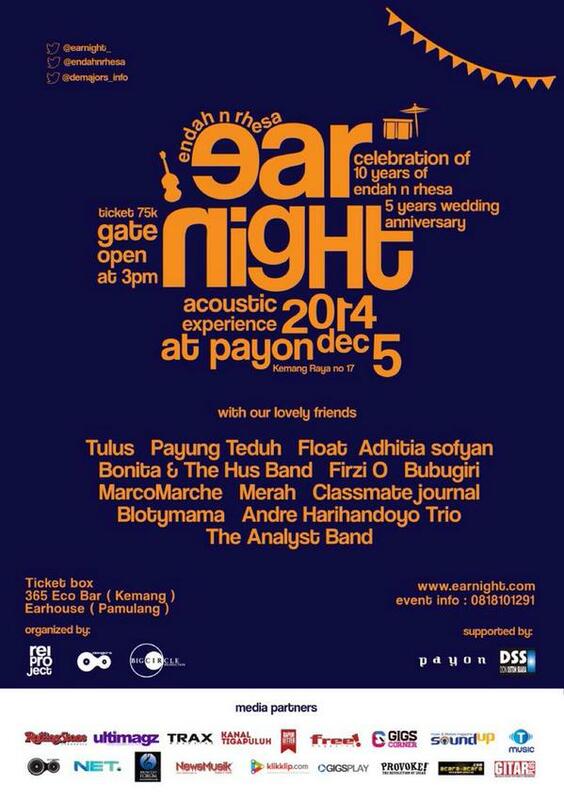 That’s why I was very excited when an old friend of mine – Cindy – posted an e-flyer of an event called “EarNight 2014”. It’s an acoustic night to celebrate Endah and Rhesa‘s 5th wedding anniversary, which had the performance of them plus Tulus, Payung Teduh, Adhitya Sofyan, Float, and some other indie musicians. In short, it’s the kind of event I wouldn’t miss back in the days! I contacted Cindy and asked her if she would like to go. The event was held last Friday in Kemang and we ended up going with one other friend, Yayi – so it was the three of us. I had lots of fun!! Although we were not able to stay until the event’s finished because we’re too tired hahahaha but I did catch a lot of stellar performance from the artists. Oh btw, here are some songs from the artists I mentioned above, hope you’d enjoy them as much as I do! P.S this is my favorite song of Float, and I have never seen them performing this live until last Friday! It gave me chills! I miss that too here. So I try to go to Concerts and small festivals here, the atmosphere is different though from when I was back at uni in Indonesia. Soal ngerokok, I totally get that way too. Tapi waktu aku terakhir nonton Payung Teduh itu di Gandaria city, jadi terbuka tuh Ta. Mungkin cari yang gitu. Oh BTW bagaimana kalau cari temen yang kerja di musik? jadi selalu bisa pergi hahaha. Itu kerjaan ku kalau pulang, ngekor temen ku yang kerjanya stage manager. Tapi enaknya di Inggris kesempatan liat musisi internasional jauh lebih besar ya 🙂 Hehe. Kemarin itu pun konsernya di Payong, outdoor, jadi seneng karena bebas asap rokok. Jarang banget ada acara yg bebas asap rokok di Jakarta… hiks. Iyaa Non, suaranya enak banget, adem gitu. Ternyata live nya seindah rekaman nya pula..
Tulus! I listen to him every day on my way to work 😀 mau banget nonton doi live, pasti thumbs up banget! Iya, bagus banget Ilse, suara live nya sama kayak rekaman.. bersih bangettt! Next Next post: Our job = our life?